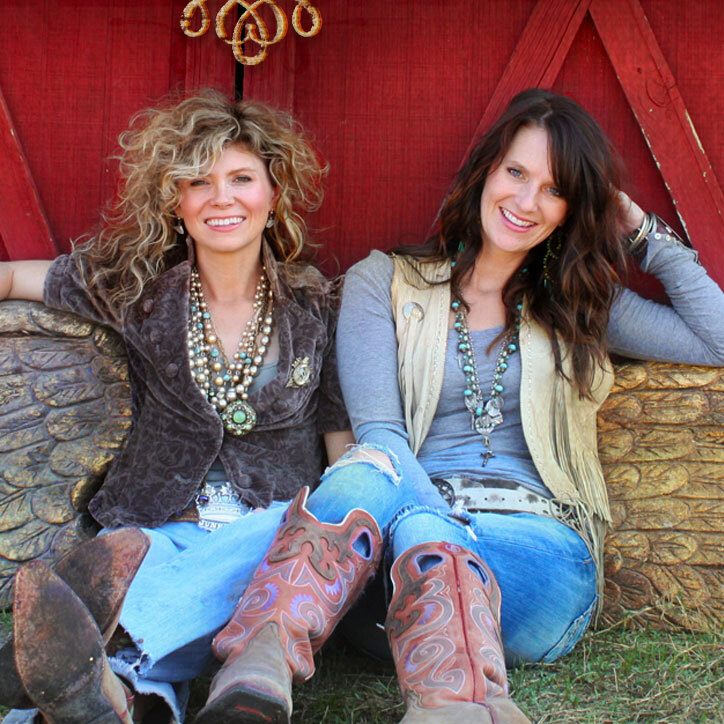 In tribute to all the ROadside bars, seedy dives, and backROAD dancehalls that have inspired MiRaNda LamBErt along the way, she’s decided it’s time to hit the AmERICAN highways … like a troubadour cowgirl on the run. 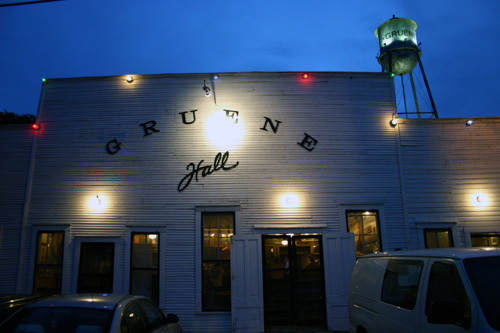 With an old suitcase filled with her best worn-out jeans, her cleanest dirty shirts (and of course, her JunK GyPSY gear), and her PinK guitar slung over her back she’s going back to her music roots…BaCK to all the beauty, character, and soul those iconic bars hold within their legendary walls and on their old creaky dance floorS. 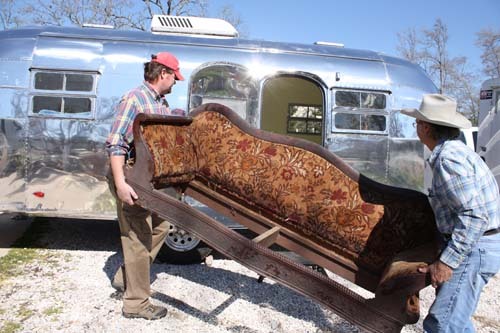 Soooo before she hits the road, we gypsies are decking out a 1953 FLYinG CLOUD AiRSTREAM! WE’vE got 9 days to turn this SiLVER buLLET into a hip-hoppin, honky-tonkin’ happenin ParKIN LoT saLOOn for MiranDa’s new tour, RoADSIDE bARS & PinK GuiTARS!! sooo, we randomly came up with the tour name for MiRANDA years ago.. 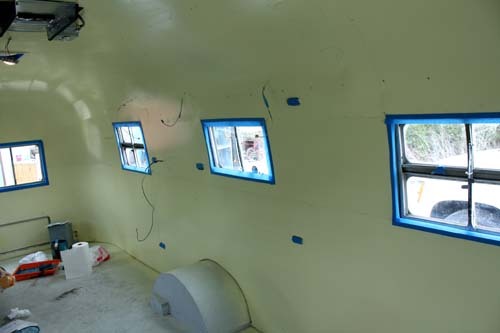 So FaR, we’ve painted the inside MeTALLIC turQUOISE. 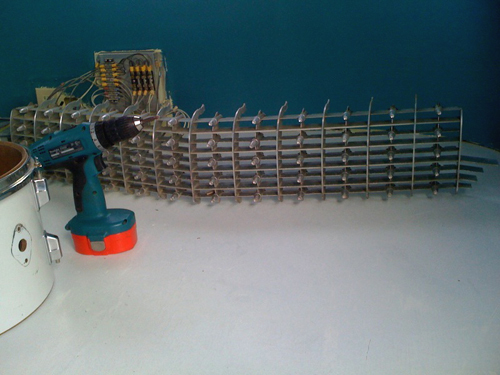 yep, METALLIC…it is sooo rockin’! we saw it, we loved it, we had to have it. Here’S the SoFA…salvaged 1800’s piece from HeCTOR the COLLecTOR years ago. StAY TunED…we’ve GoT biG pLANS for this baby! 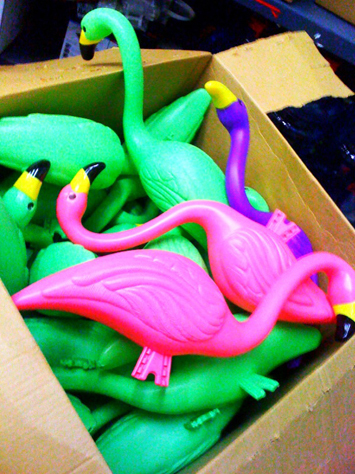 and soooo much more stuff you’re gonna loooove! 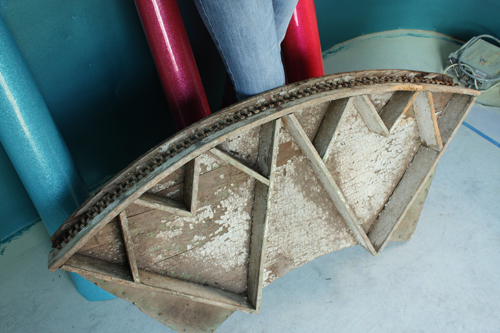 -bar installation, circus wheel, and FLooR! Mercy! I’m LOVING the metallic turquoise paint. … keep the updates comin’ …. 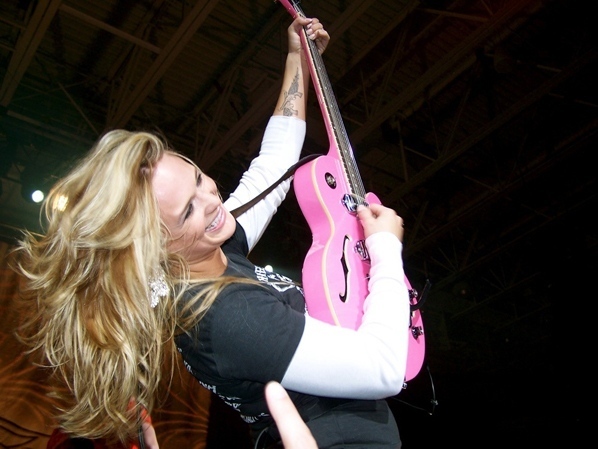 goes without saying i love miranda lambert!!! how cool is that she is going to travel in what you recreate!!! i will be back to watch this progress!!! glad i tripped onto your site today! NOw, I am loving this and I know it will be awesome from your previous re-do of the big rig. Now, will that beautiful sofa fit theough that doorway? 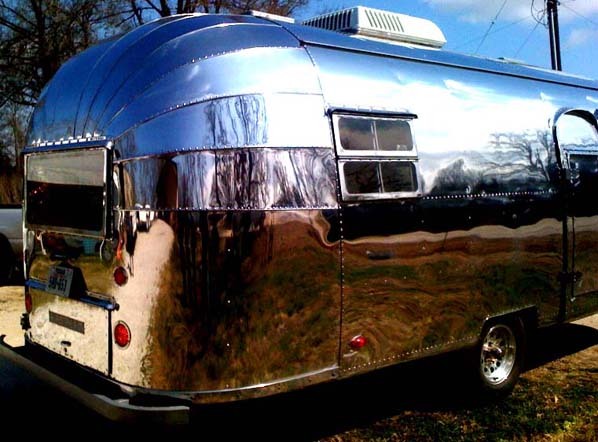 I would love it in my little 1963 Shasta Teardrop trailer, AND I am on the look out for that Airstrea Song Miranda wrote! Where did you get the paint?!? 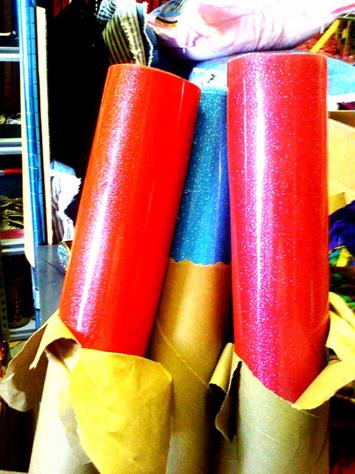 LOVE….now…where could I use it?! HoME DePOT! RaLPH LauREN MEtaLLICS…We Loooove it!!!! This project is soooo Miranda. Can’t wait to see the finished product. It’s gonna ROCK. But it’s gonna rock Gypsy style. I am so excited to see the progress and cant wait for the finished product! You guys are phenomenal and I know it is going to be so cool! My bedroom is painted that exact same color and I have never loved a paint color SO much! 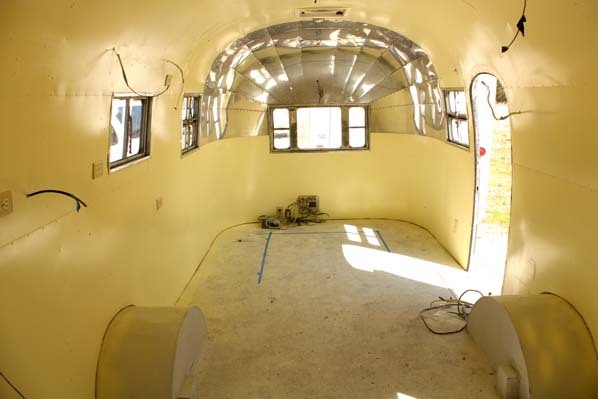 I love what ya’ll are doing to the airstream. love it, love it, love it!!!!!!! I just want to be there with you all. Wild Things, you make my heart sing! Can’t wait to see what evolves with the airstream! OhMaGosh! 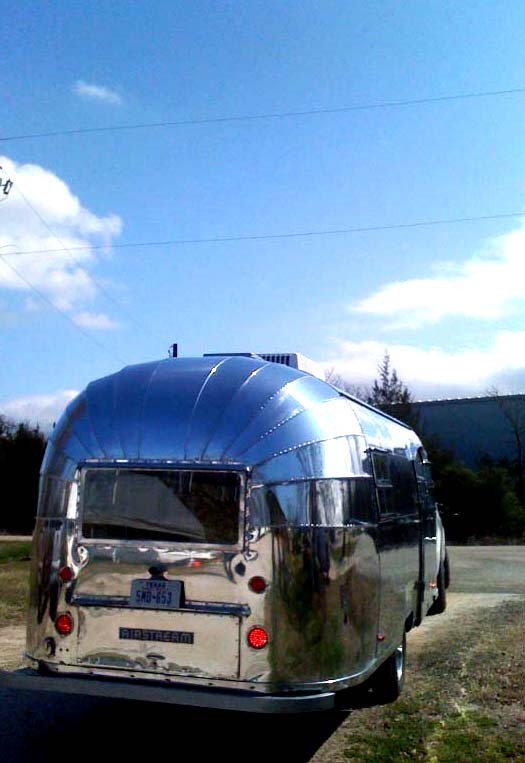 It was around Spring Break weekend & I was headed to the local bootshop & this (well, technically not specifically ‘this’ exact one, but “a”) Bee-u-tiful, Shinnnny Airstream caught ma eye! I SOOO wanted to follow it, haha – just to get a better look (knowing Nothing about you gals’ project). I just loved the nostalgia of the tin can on wheels, but I HAD to pick up my boots before the shop closed!and missed it. I went home & raved to my husband about the tag-along silver bullet, lol. I am dying to know if y’all were in South Texas (Corpus) during your time with the project??? Is there any final footage of the project? I’d love to see how y’all gloriously junked it out! Maybe i missed it, I’ll keep lookin’! Great job on the trailer! Interested in where or what the stamped metal panels are that are used on the cabinet next to the couch? 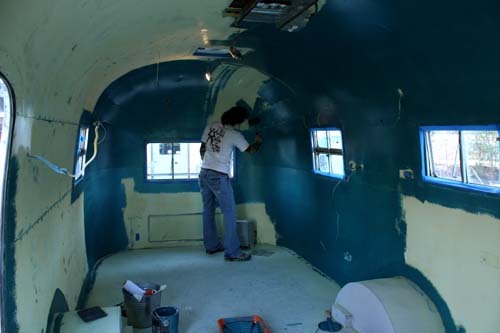 Can’t wait to see what the finished interior looks like; we’re currently upgrading a 1977 Airstream.